Seraphim Ward is of Creole descent and in every aspect of her work, she displays her enchanted charm beautifully. Hailing from the south parts of the United States, Mississippi, New Orleans and Indiana, she shivers that ‘ole southern hospitality warmly inviting to all. Seraphim Ward was born with a severe speaking impediment disorder that was said to be severe enough that recovery to obtain an normal speech would not likely be, Seraphim grew a custom to literature knowing this was the only outlet for communication since she could not complete a full sentence not alone pronounce a entire word. Seraphim Ward was teased a lot as a young child that continued up into her late teens, for her nature and disorder, this caused her to become an introverted mute for some time. Having love for literature Seraphim Ward began writing her emotions and thoughts in a very expressive manner creating a world around her that reflected in her likeness and flaws. Seeing that she did not fit or belong, Seraphim ran away at 15yrs. old, returning back home for just a short period of time after, envisioning where she belonged and what she wanted to become, Seraphim Ward left for Hollywood, still held bound to the stuttering speech disorder, she religiously practiced on her speech daily, hoping eventually it would go away. Seraphim Ward along with the other hundred’s of Hollywood run-a-ways, became a child of the night hidden away in the dark shadows. The run-a-ways formed a safe group on the streets, looking out for one another creating spanging and sleeping shifts, in which Seraphim became Willow, the one protected in darkness. She continued to write in her notebook lyrics, poems and vivid stories of creation in another realm, show her passion of interest in it. Seraphim Ward caught the eye of an manager for talent in Hollywood, who signed her, placing her in a place to safely live and sent her out for auditions for commercials, modeling and print work. Seraphim booked work, three national commercials in a row shortly after… Kraft’s Macaroni and Cheese, Foot Locker, Macy’s (back to school) and a J-Crew print ad. She went on to model for designers and high-end boutique stores in Beverly Hills such as Be Be, XoXo and Theory among many. Being able to take care of herself now, Seraphim Ward got a one bedroom apartment on her own and continued to push in the Entertainment Industry. Not too long after Seraphim realized her speaking impediment was not present anymore and marveled that she has no regulation of the pinpoint moment when it stopped, a few years would pass before Seraphim Ward’s stuttering disorder untimely return, Seraphim began writing down her emotions, feelings and thoughts on paper again documenting her complications in words. This would lead her into her first music demo recording filled with the material she wrote during and after the disorder left her again. 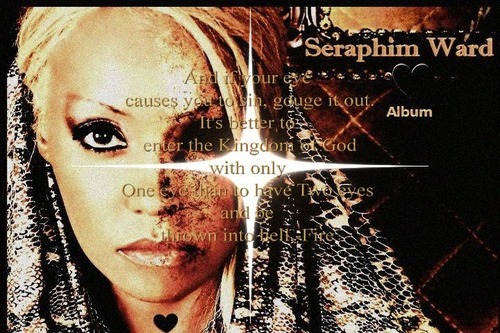 Seraphim Ward was introduced to a church in Los Angeles where she joined the choir and the praise dance team, hailing to church 5days a week for rehearsals and service, Seraphim thought this would be an great asset for her to ground her spirituality balance once again. This was short lived when Seraphim was told “she did not belong and she has no business being there”. With the now distracting situation, Seraphim Ward left and never looked back. Her first Demo was recorded and which her Influences were Garbage, Nine Inch Nails, Nina Simone and Concrete Blonde. Seraphim Ward met one of her influences Trent Reznor from Nine Inch Nails through a mutual friend, and they began dating, Trent introducing Seraphim to his family in Mercer, Pennsylvania, was more than just a vision for Seraphim Ward it was a family she grew not to have and a friend she could always look up to and trust. Trent Reznor offered to lend a helping hand to Seraphim Ward with her music, but Seraphim felt it was right that she did the beginnings of her recordings herself, stating “this is something I have to do for me, I don’t want to use Trent Reznor for that”, even today, he remains a positive illuminated figure in Seraphim Ward’s life and path, having given guidance and directional advise to her that carried Seraphim through even some of her most darkest moments in time, including her suicide attempt. Seraphim Ward began the promotion of her single “Bad Behavior” as well as her movie features, having shot a three day music video shoot for the single that was commercially displayed she was advised to hire an professional publicist to get the leak out about herself as an artist and filmmaker through her Sin Icon Production Music and Film company. Seraphim Ward was over excited with her new adventure, wanting to eagerly show forth her professionalism to her newly signed business partnerships by advance promoting, when Seraphim Ward was lead to Infamous Publicist Jonathan Shelton Jaxson by chance, who signed on to do publicity for Sin Icon Productions and Seraphim Ward for two months. Within a few days “Life and Style” magazine released a world wide scandal saying “Seraphim Ward and Marilyn Manson are engaged” which is not true and did not come from the mouth of nor a confirmation from Seraphim Ward that this rumor was true a complete Publicist Publicity Stunt. The irony of the whole scandal is that Seraphim Ward was dating Pogo Madonna Wayne Gacy, the x-keyboardist of the band “Marilyn Manson”, in which, they were living together in her Hollywood Hills home at the time. This was not in any way an appropriate way to introduce Seraphim Ward nor a way to give honor to all her hard work, perseverance and obstacles, she had to pull through in her past to get here. Seraphim Ward and Pogo Stephen Bier Madonna Wayne Gacy, split after the heat and pressure of the scandal and the negative attention, direction that it was given and taking. Seraphim Ward has chosen to take some personal time out for herself to focus on her three year film and music contract deal, and to get pass and plow over this destructive situation that has been created. As for the publicist Jonathan Shelton Jaxson he did not fulfill his two month contract as publicist leaving the mess he created in the media, saying it just got to be too much for him to handle “Life and Style” magazine did a reprint to the article as a “Damage Control” to Jonathan Shelton Jaxson, reprinting the quote’ “Seraphim Ward told me she was engaged to “Marilyn Manson””.